Toward the end of this novel, Alastair, one of three narrators, says, ". . . I guess you can eat love after all. It's just a different kind of food. . . It's like a food. Just doesn't fill your stomach." It fills your heart, just like The Simple Art of Flying will. 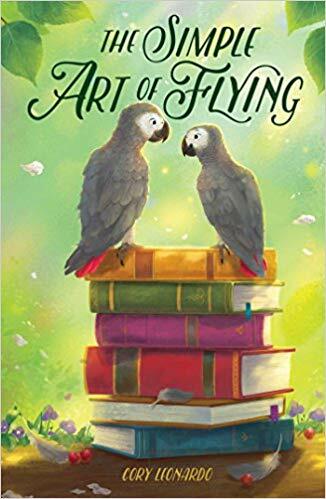 Alastair, an African grey parrot with a penchant for poetry - writing and eating it - is the first narrator of this four part story, each of which has a pair of literary-bird headings, like "One Flew Over the Parrot's Cage," and "Parrot-ise Lost." Hatching in the back room of Pete's Pet Shack, Alastair listens to the peeps coming from inside the two other eggs in the nest. Three days later, with words of encouragement and helpful chips at her shell from Alastair, Aggie hatches, "a warm beam of incubator sun." Her first words to Alastair, to be echoed later in the novel, "Oh, there you are!" The third egg, which never hatches, links the other two narrators of The Simple Art of Flying. Fritz Feldman is eleven-years-old, determined to become a doctor, a bit of a hypochondriac and a part-time, under-the-table employee at Pete's Pet Shack. When Pete tells Fritz to feed the unhatched bird to the snakes, he refuses and decides to bury it on his own. But, he forgets to take the egg with him. Albertina Plopky, who readers first meet by way of a letter written to her (deceased) husband, Everett, making a late night run to Pete's for fish food, ultimately takes responsibility for the egg, burying it in the nearby cemetery. Over the course of a year, readers learn more about elderly Bertie, her fierce independence equaled only by her love of her pets, mostly through letters she writes, and more about Fritz through his journal. As the lives of the humans play out, so do the lives of the parrots and the various pets at Pete's. Aggie struggles with her health, made worse by Pete's inattentive care, and Alastair struggles with anger and resentment at being born in captivity. He is constantly pulling out his feathers in frustration while planning their escape and biting the hands that feed him, resulting in two broken wings. When Fritz purchases Aggie and Bertie purchases Alastair, convinced he needs to rescue his sister, Alastair's plan of escape intensifies as does his refusal to see that Aggie might be happy with Fritz. Themes of food run throughout, with both Fritz and Bertie enjoying the cooking show hosted by Letizia Tortelloni, which the birds also listen to. And, although Alastair refuses, even after eating Fritz's science report on the topic, to believe that there is such a thing as a cherry tree, cherries are his favorite food. Noticing this, and hoping to win him over, Bertie bakes Alastair her prize-winning Cherry Chocolate Crumble, minus the chocolate, which is poison for parrots. And one of Bertie's final letters in the book is a long meditation on life, pie, cherries and pits, in which she realizes that, while you can crack a tooth on one if you chew on it, pits are also seeds, seeds that can become trees. And, "Trees can fill your bowl and a hundred others with new cherries - different cherries - but sweet ones," if you can just spit out that pit and move on with life. Sometimes cherry trees do exist.